“Music Flows in the Library” hosted on September 13. Students walking by with heavy backpacks on their shoulders, carrying, in addition to their books, the burden of society’s expectations as well as their own: this is an image typical of a library of any elite school around the world. SNU Main Library is striving to shake off this grim and monotonous image. The SNU Main Library has been successfully carrying out its new “Cultural Library” project, promoting its image as an institution furnished not only with knowledge but also with culture. Alongside a variety of stimulating activities such as movie nights and talk shows, SNU Main Library hosted several special programs in September 2018. On September 13, during the 2018 SNU Art Week, SNU Main Library and the College of Music co-hosted the annual “Music Flows in the Library” event. 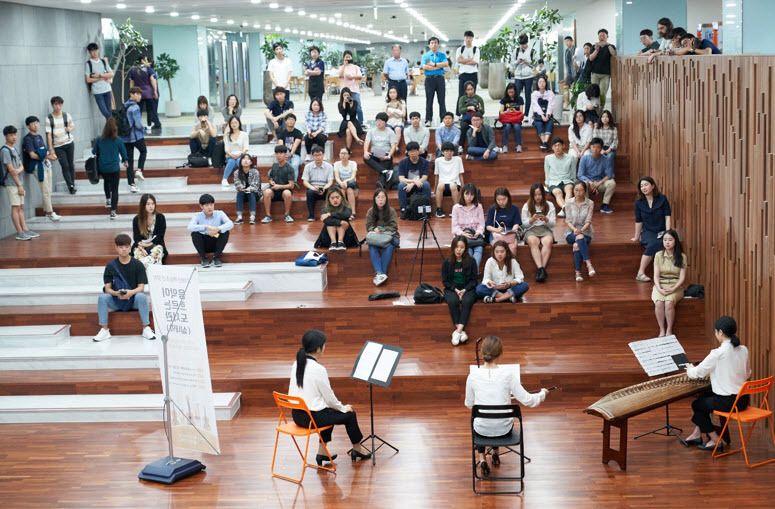 This year, Korean students and international students on campus came together to offer a collaborative performance of Korean and Western music. Students, listening to the beautiful harmonies, were able to ease some of the stress that comes with the start of the new semester. On September 18, there was a book launch with Professor Seo Min (College of Medicine at Dankook University). Professor Seo, a renowned expert on the study of parasites, is a public figure well known for his humor and insight. Students were able to take a break from their studies by listening to Professor Seo discuss the relationship between humans and parasites, as well as share excerpts from his new book, Seo Min on Reading: Why Should We Read? To keep up with the latest library events, see www. http://library.snu.ac.kr/notice.